i absolutely love to read but finding time makes for a rare occurrence, so when i do i usually head for john grisham or the late dominick dunne who is hands down my favorite writer. makes sense, love page turners. so called “self-help” books are a bit too “pie in the sky” for me. i like a book that doesn’t have me work too hard. then i saw it, a book called 10% happier by dan harris. with my curiosity peaked and nothing to do while waiting for a flight, the title stopped me in my tracks but what really got my attention were the words following the title, “how i tamed the voice in my head, reduced stress without losing my edge, and found self-help that actually works.” i bought it. backing up… mid-year 2004 the news anchor, dan harris, had an on-air panic attack in front of over five million people on the set of good morning america that sent him on a years-long journey of exploration into meditation and alternative religions. having been told for years that i really need to start meditating, i decided this was something i needed to give a shot. two main reasons stopped me from meditating. my fears were allayed knowing there were quite a few people with the same concerns, specifically dan harris. you may lose your edge, and wasn't this just for gurus and yogis? that would be a big “no!" then I found out people from athletes to c.e.o.s have been using meditation to help with concentration, productivity, and most importantly to respond as opposed to react; to stop the voice that never stops. “i need to go to the market,” “remember to pick up cleaning...” you know the drill. it’s called the monkey mind. fits perfectly! i’ve always sped a little too much and i’ve always thought that it gave me an edge. turns out it doesn’t. i’ve always found myself racing to the next “thing.” or worse, living in the past. either way i’m missing what’s most important: now. don’t get me wrong, i’m not unhappy, but to be 10% happier? sounds good to me. and realistic. 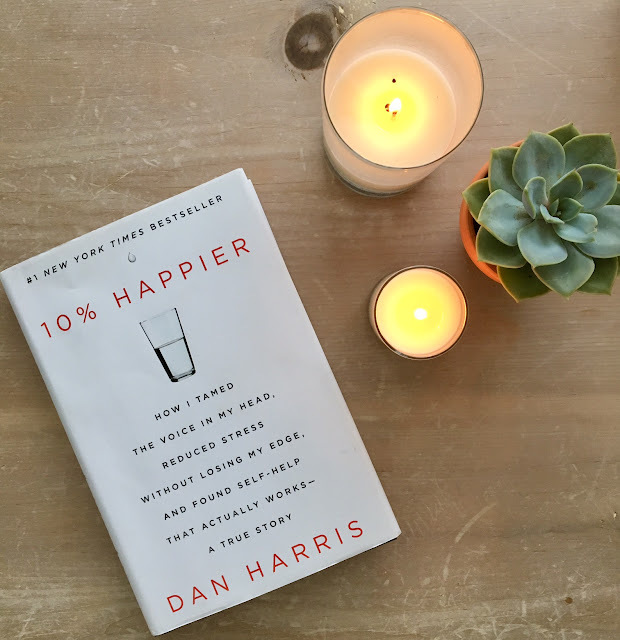 so it goes that news anchor dan harris came to write this book for those of us that want to be 10% happier! as i write this i realize i’m back in my monkey mind...doesn’t take me long. skipping from one paragraph to the next editing, adding, deleting. this is going to take some practice!